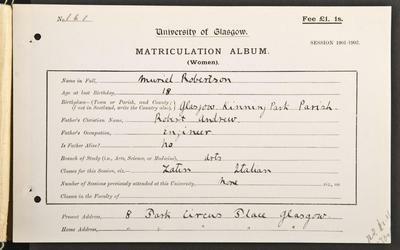 Whilst studying in the arts at Glasgow University Muriel Robertson was taught Zoology by professor Graham Kerr. Protozoa in particular fascinated her and Kerr gave her a bench in the laboratory to work on them. In 1905 she was awarded her MA and published her first scientific paper. 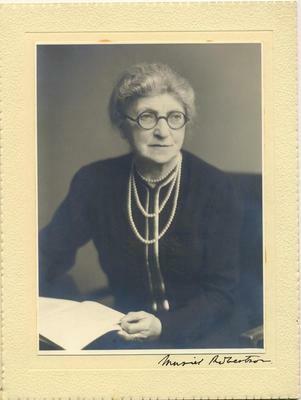 She moved to Sri Lanka in 1907 to study trypanosome infections of reptiles and in 1911 took a position in Uganda where she succeeded in elucidating the life cycle of T. gambiense, both in blood and in its insect vector, the tsetse fly. This work resulted in several papers, the most important of which appeared in 1913 in the Philosophical Transactions of the Royal Society (203, 1913, 161��"84). In the papers, the soundness of her scientific observations was matched by the elegance of her illustrations. She noted the undulating parasitaemia associated with trypanosome infections of mammals and predicted that this related to destruction of parasites in waves by blood plasma. Her work anticipated the modern view that antibodies are raised to trypanosomes that sequentially express a multitude of different variant surface antigens, work pioneered by Professor Keith Vickerman in Glasgow. She also noted how it was only the short stumpy trypanosome that could transmit to the tsetse fly. She went on to develop diagnostic tests for Trichomonas foetus and also made important contributions to research into Clostridium species. The disease in cattle remains arguably the most important veterinary problem in Sub-Saharan Africa today. Obituary. 1976. Journal of General Microbiology. 95: 1-8. Robertson, M. 1912. Notes on the life-history of Trypanosoma gambiense, with a brief reference to the cycles of Trypanosoma nanum & Trypanosoma precorum in Glossina palpalis. Philosophical Transactions of the Royal Society B 203: I 61-84. World Changing Project, "Key discoveries of the life cycle of Trypanosomes," in University of Glasgow World Changing (University of Glasgow, 2010); http://www.worldchanging.glasgow.ac.uk/article/?id=83 (accessed April 26, 2019). World Changing Project. "Key discoveries of the life cycle of Trypanosomes." In University of Glasgow World Changing. University of Glasgow, 2010. http://www.worldchanging.glasgow.ac.uk/article/?id=83 (accessed April 26, 2019). World Changing Project. "Key discoveries of the life cycle of Trypanosomes." University of Glasgow World Changing. University of Glasgow, 2010. 26 April 2019 <http://www.worldchanging.glasgow.ac.uk/article/?id=83>.